As the launch date for a new iPhone gets closer, the value of old iPhones tends to depreciate rather quickly. To help consumers get the best value, Gazelle, the nation’s leading consumer electronics trade-in site, today announced the extension of its industry-leading price lock guarantee for orders placed before September 9th. With this extended price lock, consumers can get today’s price for their old or unwanted iPhone, and hold on to their device until after the new iPhone is in hand. Consumers who lock in an offer between today and September 9th will have until October 10th to send their old iPhones to Gazelle.Visit Gazelle today, and see what your iPhone is worth! 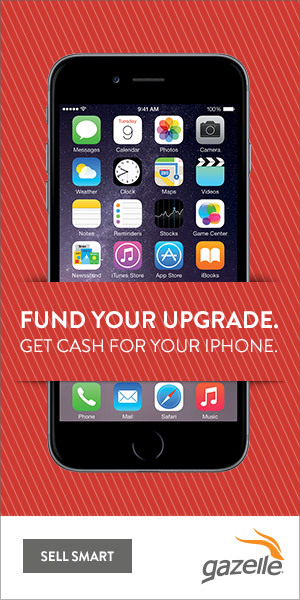 I personally sold my iPhone with Gazelle and received way more than what my wireless carrier offered. It's very easy to do and I highly recommend Gazelle.